In April, 54 Dalit women from Nemili village in Thiruvallur district, Tamil Nadu received housing plots of 2.5 cents each. Since the year 2000, Dalit women from the village had been petitioning hard for housing pattas. 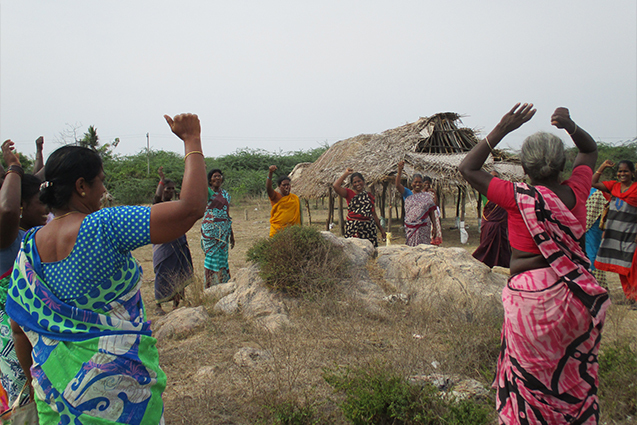 These women are part of the state-level Tamil Nadu Dalit Women’s Movement supported by Society for Rural Education and Development (SRED) and our Tamil Nadu Regional Office. Through the years, they continued to determinedly approach the village administrative officer, revenue officers and other concerned officials pursuing their case. Finally victorious, these women have put up temporary sheds on their respective plots, and with support from the movement, will now be applying for housing-support with the government. “This achievement is the result of the collective struggles of Dalit women,” exclaim the triumphant women with victory shining bright in their eyes.